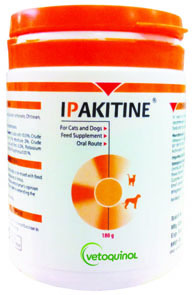 Ipakitine shall be given in CKD & Renal failure. It should be started from stage II of IRIS guidelines Or When serum creatinine level goes beyond 1.4 mg/dl in dogs & 1.6 mg/dl in cats Available in 180 gm. Nutritional feed supplement.